Butter the ramekin bottom and sides all the way to the top edges (this will allow the soufflé to rise above the edges) and sprinkle the Grana Padano onto the sides and bottoms of each ramekin. Set aside. Melt the remaining butter in a medium sauté pan. Slowly add the flour and blend with a whisk (no lumps allowed) and cook for a few minutes to cook off the flour taste. Reduce the heat and slowly whisk in the scalded milk and then add the dry mustard, thyme and marjoram and continue to cook for about a minute until thick and smooth. Remove from heat and slowly whisk in the egg yolks. Then add the gorgonzola and the remaining Grana Padano cheese and season to taste with salt and pepper. Place this mixture into a medium sized bowl and set aside. Place the egg whites and the cream of tartar into a large bowl and with an electric mixer beat the whites to firm peaks. Into the bowl with the gorgonzola mixture whisk in about a cup of whites to lighten the mixture and then GENTLY fold the remaining egg whites into the mix about two cups at a time. You want to maintain the air in the egg whites as much as possible. Divide the mixture into the 4 ramekins with a spoon and then smooth the top. 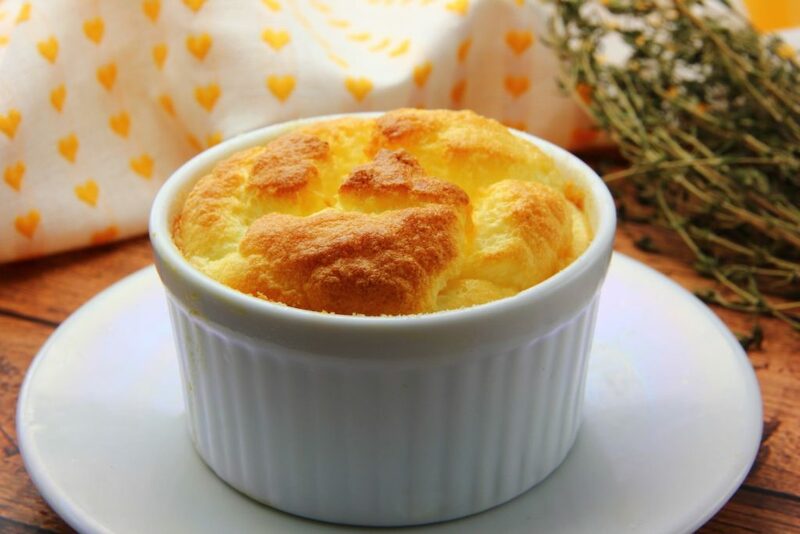 Place the four ramekins on a baking sheet, place them in the preheated oven and then close the door. Reduce the temperature to 375° and leave them in the oven for 15-18 minutes, try to not open the door. Test for doneness by inserting a knife in the center and it should come out clean, a little wet is fine, but the mixture should be cooked through. Place each ramekin on a dinner plate and quickly top with ¼ cup of basil chiffonade. Drizzle with Lemon Champagne Vinaigrette and freshly cracked pepper. Serve immediately. Blend everything except the olive oil together. Slowly whisk in olive oil. Stack the basil leaves, roll them like a cigar, and slice into thin ribbons.